Two weeks ago I shared with you my first experience using Gelicious Hybrid Nails. I was very quickly won over by their product and completely get why so many girls love using at home soak off gels. One of these days I'm going to buy some other brands of soak off gel to test out and compare, especially with regards to removal. I recall reading a facebook comment from someone that found the Gelicious Hybrid Nails so much easier to remove than other soak of gels, so I want to try that out. But then again, why change when you've found something you love. The only complaint I had with the Gelicious range was the lack of real swatches to see what each shade looked like on a real set of nails. That's why I'm so excited to say that Gelicious sent me a few colours to swatch and review. The one I'm showing you today is called Dip in the Pool. 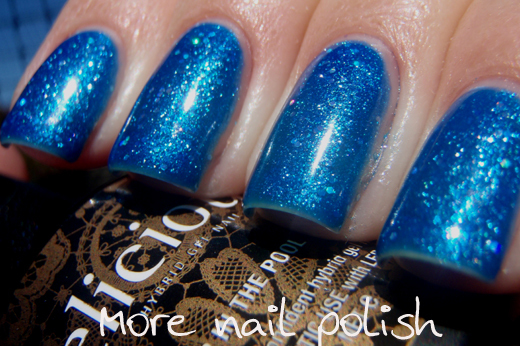 Dip in the Pool is a stunning bright blue shimmer polish with small blue holo hexes. 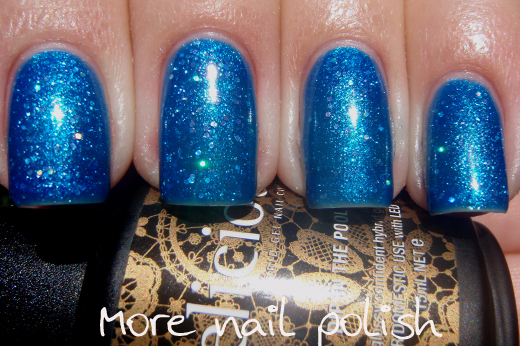 The shimmery base doesn't apply streaky, and is packed full of blue glass fleck shimmer. The holo glitter pieces flowed perfectly onto my nail and spaced out nicely. Of course if they didn't, you have all the time in the world to wipe, giggle and place the polish and glitters before putting your hand under the UV lamp. Colour coverage was excellent. 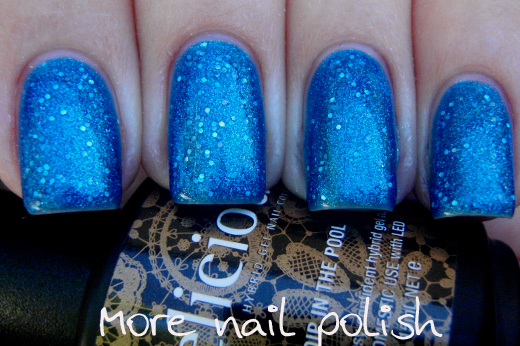 I applied two thin coats of Dip in the Pool and then applied the Ultra Glaze Top Coat. There is nothing like putting on a full glittery mani, and then putting on the gel top coat and immediately getting that high shine gloss that would normally take me about two or three coats of Seche Vite to achieve with a glitter mani. Here is Dip in the Pool shown in full sun. Here is Dip in the Pool in the shade. 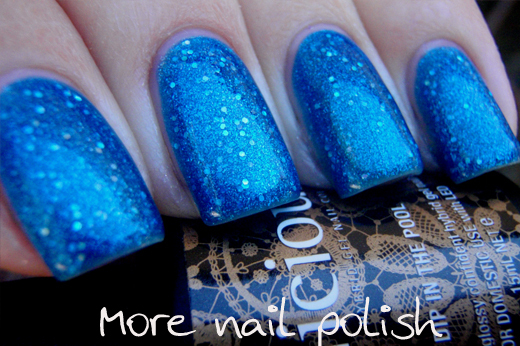 This is such a stunning colour and, to use a nail blogger cliché, it has so much depth. After putting this on I actually went for a real dip in the pool. 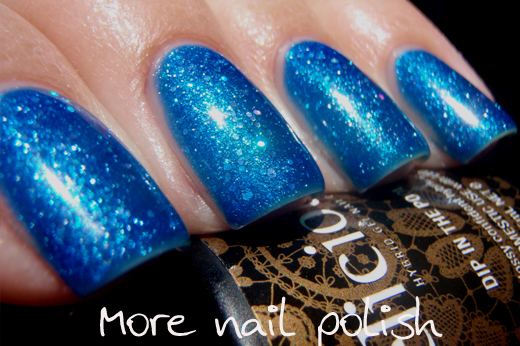 This polish is nearly an exact match of the fiberglass shell of our pool, right down to the glitter and shimmer. During summer, when we swim a lot in the backyard, my nail polish generally chips and flakes off very quickly. My nails get so soft in the water that the polish just flakes away. And I wont even mention about wearing a PVC basecoat in the pool - your nails literally float away into the skimmer box. So where I am I going with all this babble? Ah yes, my nails looked just a perfect after getting out from a two hour play in the pool with the kids, as they did after I just applied it. Whoo hoo. The removal of this one was different to the other two gelicious polishes I have tried (Gold Digger and the optional base coat) I used the foil method to soak for 10 minutes, and when I went to take them off, they were completely removed and the entire full piece of nail polish was sitting on the cotton swab. I didn't need to do any scratching or rubbing at all. I'm not sure if this will always be the case with this bottle of polish, or if it was just a one off, but I loved removal because it was so clean and easy. What do you guys think of this colour? Oooh, and can I just say I'm really loving my nails right now. They have a bit of length, they are all even and none of the corners have come off. I think I can attribute much of that to wearing gelicious base coat 90% of the time for the last three weeks. Now I just need to remember to moisturize. Can't wait to see your reviews of other colours... I agree, I would prefer to see proper swatches. I have had on Bubblegum Yum almost all week and my only complaint is that it lasts too well... I feel like changing it already, but it looks perfect still! I tried to do a crackle over it, but found that didn't work. Still great to remove it and still find my nails all glossy and the original colour underneath! 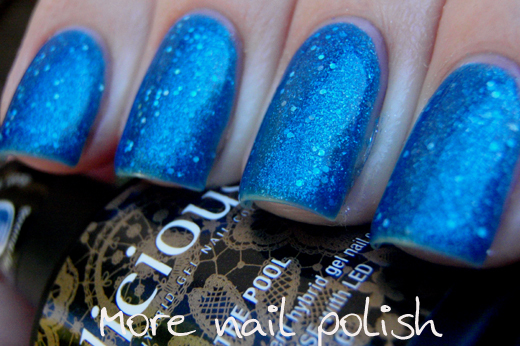 Stunning swatches of such a lovely polish. Thanks so much for showing these polishes off in a way that we can truly see their full beauty. I love having a perfect manicure that I can dress up with nail art and so on, to change the look without sacrificing the durability and strength. I can't wait for more of your swatches. On my fingers I use gel base, gel top then *any* colour and Seche Vite. Then I just use non acetone remover to take off the colour and Seche and leave the gel in place. I leave the gel until it gets chippy or too grown out. I've noticed that some colours can stain the clear gel. Eg PS Santas Sunburn made the gel base go pink. But, at least it's not staining my nails, and I cover up the gel again anyway. I got the $119 mini package. They have sales and discount codes and sell through Catch of the Day. I think 'CLUBLIFE' gives 20% off, but it's a once off discount. Thanks! That makes a little more sense. I'm currently looking at Orly too....gotta google some more! Oh my, this is just AMAZING!! What a gorgeous color!! My Dip in the Pool is nothing like yours. Mine is more green. I would never have guessed the colour in your swath was the same colour as mine. Wow, that's really interesting. I'd love to see a swatch of your green version. My photos are pretty colour accurate for this one, it really was this blue. I thought the green version would be Princess Fiona. Thank you so much for this post, i had been resistent to gels as i do not like going to salons i prefer to do my nails at home. I am now a total devotee to these uv gels and the fact they cure with LED and not a regular uv lamp is also a big plus. Id love to share some of your posts on my blog if thats ok? As there are a lot of us Gothlings outthere always looking for good polish reviews! Id love to see more reviews of DIY UV gel polish!